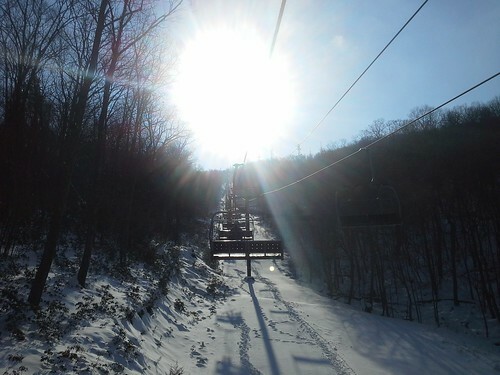 McGAHEYSVILLE, Va. — In what has become an annual tradition, my friend Ryan and I enjoyed a day of snow sports. I went skiing, my third trip this season (the previous two being at Whitetail) while Ryan went knuckle-dragging, err snowboarding. Having been to Whitetail, Blue Knob and Timberline in previous years, we wanted to do something different. 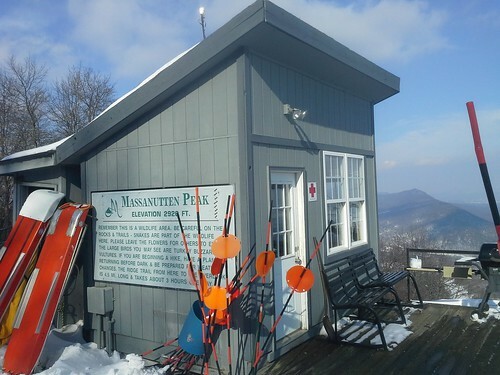 Not wanting to spend more time in the car than on the slopes and only a few days away from the Pitchers & Catchers Day Storm, we headed south to the closest ski area in Virginia, Massanutten. It would be my first time skiing in the commonwealth I live in. The drive down was discouraging, mostly rainy with some snow. However, when we arrived at the resort the skies cleared to our relief — a bluebird day! While I prefer to rent skis from a local establishment, that option was not available this week, so I had to rent skis and poles at the resort. I have my own boots – mid-1990s San Marcos, the kind that get a “wow, haven’t seen San Macros in forever” type of remarks. The lines to pay for lift ticket and rentals were fast, maybe about 6 minutes long. The rentals line was the most efficient I have ever been in though too, it took less than five minutes to get my skis and poles. However, since I brought my own boots required a quick trip to the repair shop to fit them. That was quick, so no significant time was lost. By the way, the lift ticket is not the typical sticker over a wire; it’s a piece of cardboard on a ziptie. Make sure you attach it to something other than your zipper or it will blow in your face. Massanutten has only 14 slopes overall and only half of them are blue square of above. The terrain park is isolated from the rest of the mountain. We started on Lift 3 which leads to ●Geronimo and ●Nutten To It. Seeing that Nutten to It would get us to Lift 5 and over to the blues, we took that one (Sorry Don!). Nutten to It lived up to it’s name too. Lift 5, is a triple, with a station midway up. 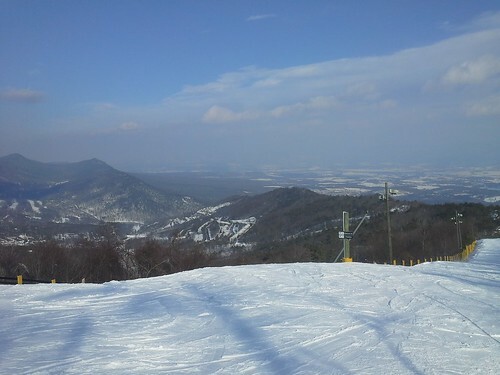 We stayed on and reached the top, taking ■Showtime, the widest slope at Massanutten. It was delightful run with moguls on the left side and changing contours throughout, a welcome departure from typical mid-Atlantic slopes that are level from side to side. Though not too steep, the contours made it quite easy to pick up a lot speed, but not put much too strain oneself. In the bright mid-February sunshine with packed powder, the conditions for most of the afternoon were as fine as I had ever had in mid-Atlantic. We also took some rides down ■Mass Transit which was fun, but not quite as much as Showtime. Mass Transit was a little icy and steeper at the top, but without the contours of Showtime. After a couple of rides on that, we moved over the black diamonds on ■Yee Ha, a tiny connector trail. We avoided ♦Mak Attack, a moguls slope because we’d rather save our legs for skiing we’re good at. Next up, it was time to go up Lift 6 to the summit of the mountain, 2,920 feet above sea level and 1,003 feet about the lodge. Here was the most spectacular of the Massanutten views with the snow covered, heavily farmed valley and the Blue Ridge Mountains beyond. Unlike most of the Appalachians, Massanutten isn’t rounded off, so the panorama is better than most in the East. The two black diamond slopes ♦ParaDice and ♦Diamond Jim are serviced by Lift 6. ParaDice, the longest of the mountain was our favorite of the day. The slope begins gradually (though the sides offered a chance for some jumps) before the first turn with the steepness increased. Like the blues, there were changing contours, a little almost half-pipe for snowboarders and a good snow. The whole trail was in sunshine, but it held up well for most of our time there. We enjoyed this trail more than any other. Diamond Jim was steeper at the top, but shorter than ParaDice. It also had a bit of ice, especially near the top. I think I would rank it my third favorite run of the day. Along Diamond Jim there is a Mid-Mountain Grill. Though it stopped serving hot food at 2:30, we got there before they completely closed up and bought some snacks — trail mix, candy bars and chips as well as soda. This proved to an important time-saving part of the day. With ideal conditions, the chance to get something to eat without having to deal with the lodge all the way down at the bottom of the mountain saved us a lot of time. We spent no more than 15 minutes getting our snack before heading back up on the lift. That was probably a 45 minute-swing timewise that allowed us to stay out in the good weather. We never even entered the lodge. After several more runs, we were starting to tire, so we made our way back to the blues. I think we got two more runs in before the sun went below the mountain and the slopes starting getting icy while still crowded. A final run down Showtime onto Southern Comfort closed out our day. There are a few ways to get to Massanutten – Google Maps suggests I-66 west to US 340 south, but we went the longer way taking I-66 west all the way to I-81 south and then down to US 33 east at Harrisonburg. With a stop for gas it took us about 2.5 hours going that way. In drier weather, we’d have probably gotten there 15-20 minutes faster. We may have visited Massanutten on the best Saturday of the 2013-2014 season. A big snowstorm was only two days past and the weather was ideal — sunny and warm enough to keep us from getting cold, but cold enough to keep the conditions in a good shape. While the wind whipped up on occasion blowing snow up on the mountain, it more a novelty than anything else. Massautten’s ski area is one of the smallest I have ever skied. It did get crowded in the afternoon (though I don’t think they stopped selling lift tickets like Wintergreen did), though the lift lines were never more than 6 or 7 minutes. I think Massanutten would be a great weekday trip and/or early/late season trip for Washingtonians. If I can accumulate enough vacation to start doing that again, I would surely give it strong consideration over Whitetail. Tags:2014 Pitchers & Catchers Day Storm, Best of 2014, Don't hate winter use it, Massanutten, snow, Va., winter sports, YAAAAH-HOO-HOO-HOO-HOOEY!